Bibles themselves are no longer with these papers. is more detail in this Bible, and later dates added in. 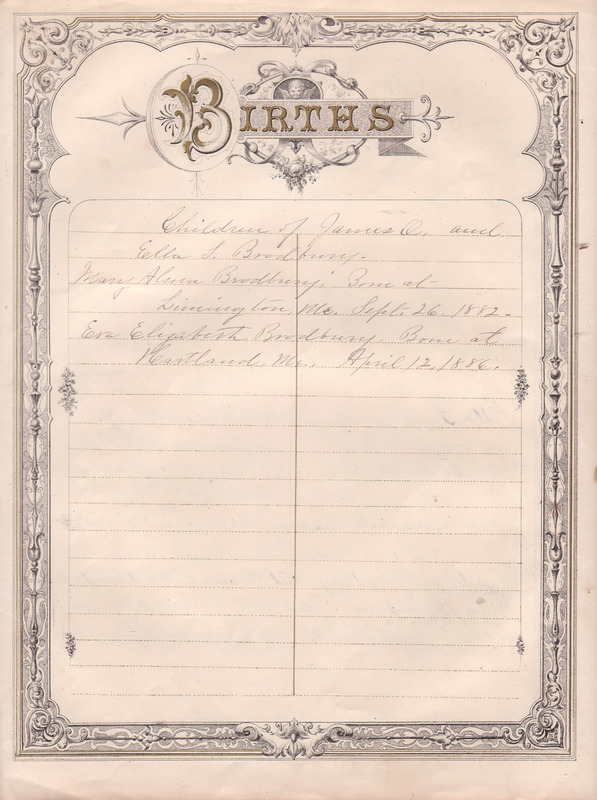 The pages look to date around the late 19th century. Transcribed by and in possession of Tracy St. Claire. Samuel M. Bradbury Born Aug. 22. 1805. Susan Brackett " Nov. 11. 1811. Elizabeth Brackett Born Feb 15, 1821. Ella S. Butler Born May 9, 1855. Allie S. Cousins Born August 12. 1858. Hardy Henry McKenney Born March 22. 1862. 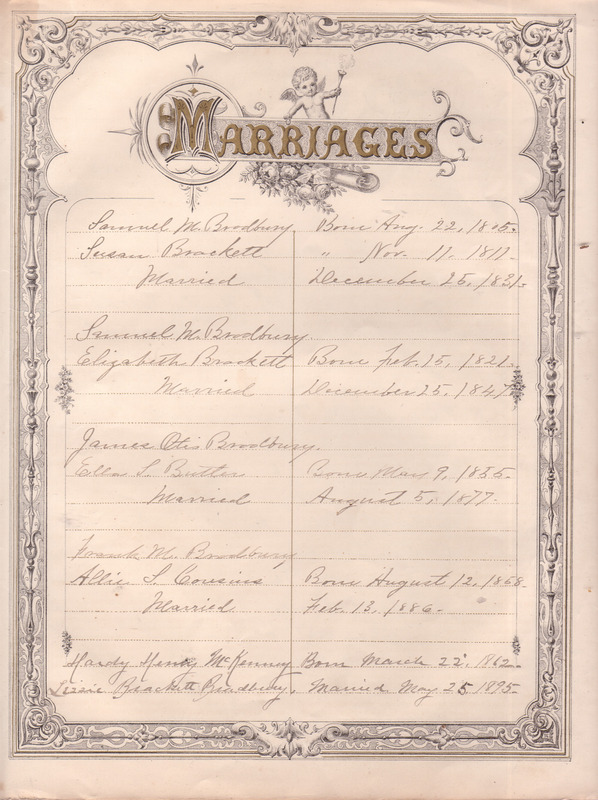 Lizzie Brackett Bradbury Married May 25 1895. Children of Samuel M. and Susan Bradbury. John Brackett Bradbury, Born at Parsonsfield, Me. June 1, 1833. Ann Elizabeth Bradbury, Born at Limington Me. August. 24. 1837. 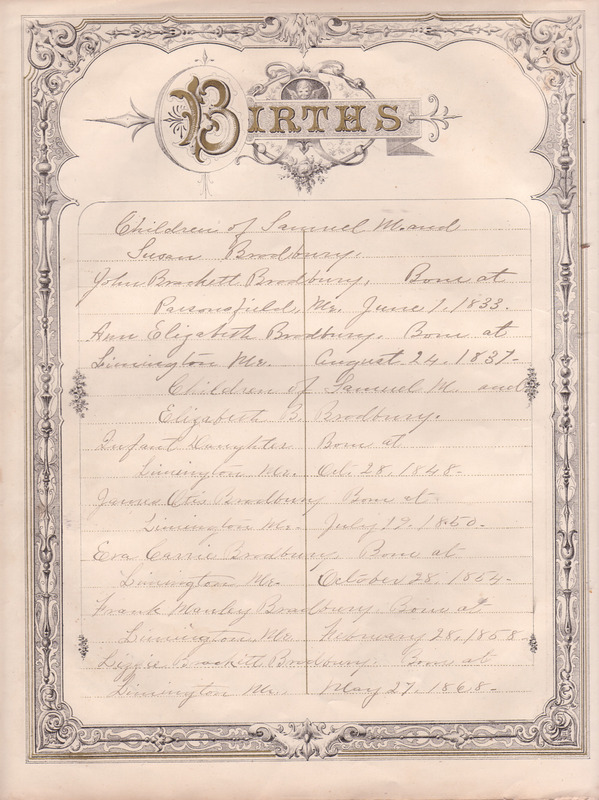 Children of Samuel M. and Elizabeth B. Bradbury. Infant Daughter Born at Limington Me. Oct. 28. 1848. James Otis Bradbury Born at Limington Me. July 19. 1850. Eva Carrie Bradbury Born at Limington, Me. October 28, 1854. Frank Manley Bradbury Born at Limington, Me. February 28, 1858. Lizzie Brackett Bradbury Born at Limington Me. May 27, 1868. Children of James O. and Ella L. Bradbury. Mary Alma Bradbury Born at Limington, Me. Sept. 26, 1882. Eva Elizabeth Bradbury Born at Hartland Me. April 12, 1886. Susan Wife of Samuel M. Bradbury. Infant Daughter, Died Oct. 28, 1848. Ann Elizabeth Bradbury " May 8, 1855. John Brackett Bradbury, " April 27. 1858. Eva Carrie Bradbury. " August 24, 1862. Elisabeth B. wife of S. M. B.
Eva Elisabeth Bradbury, December 24, 1906. Died at Norton Mass. buried at Saco. Me. 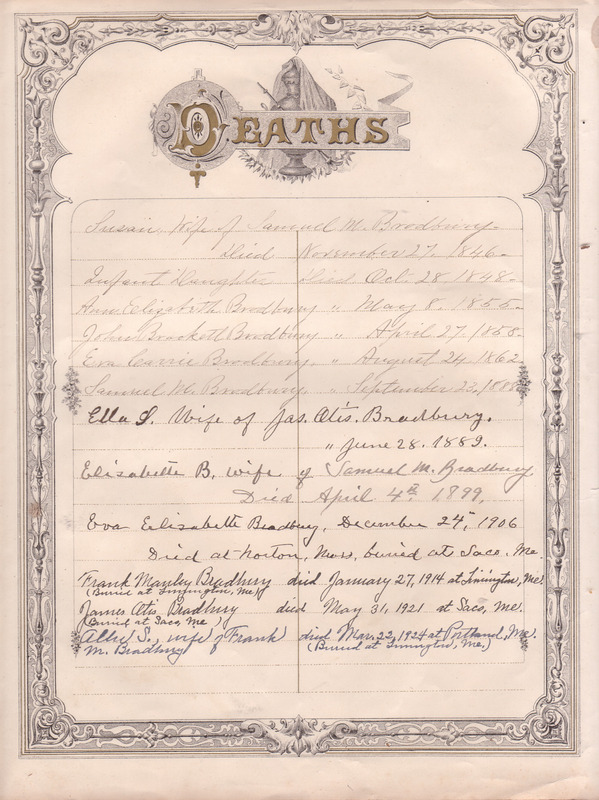 Frank Manley Bradbury died January 27, 1914 at Limington Me.